Blogs > Boat Blog > Testing for beach safety in Ulster County? Testing for beach safety in Ulster County? 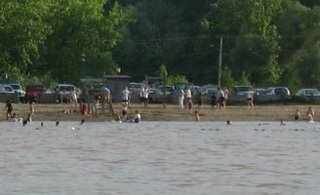 Public swimming beach at Kingston Point just north of Rondout Creek. The area has had record rains the last three days which causes many sewage plants to overflow into the Hudson. Yet here we see people swimming. Riverkeeper contacted the Ulster County Health Department and asked if water quality was routinely tested after wet weather events to check for sewage related contamination at this public beach. No, testing is done only three times a year; on 7/13, 8/3 and 8/17. With all the talk of opening additional swimming beaches on the Hudson shouldn’t testing be more thorough and shouldn’t testing be done after storms as a matter of course?